Shortlist, engage, and hire the right candidate. Zoho Recruit lets you parse multiple resumes, transfer candidate information directly into the candidate/client database, and format CVs to best represent your brand. Parse multiple resumes at once. Recruiters deal with hundreds of resumes on a daily basis. Zoho Recruit minimizes the time needed to complete this vast task into a couple of minutes. Map Zoho Recruit fields while parsing resumes from different sources. Resume data will automatically be saved onto the Recruit candidate database. Save time and quickly process a number of resumes at once. The Zoho Recruit Resume Extractor for Google Chrome is a simple and easy way to capture any resume from the web and parse it into your recruit database with just a click. Parse even from LinkedIn or any other web page. 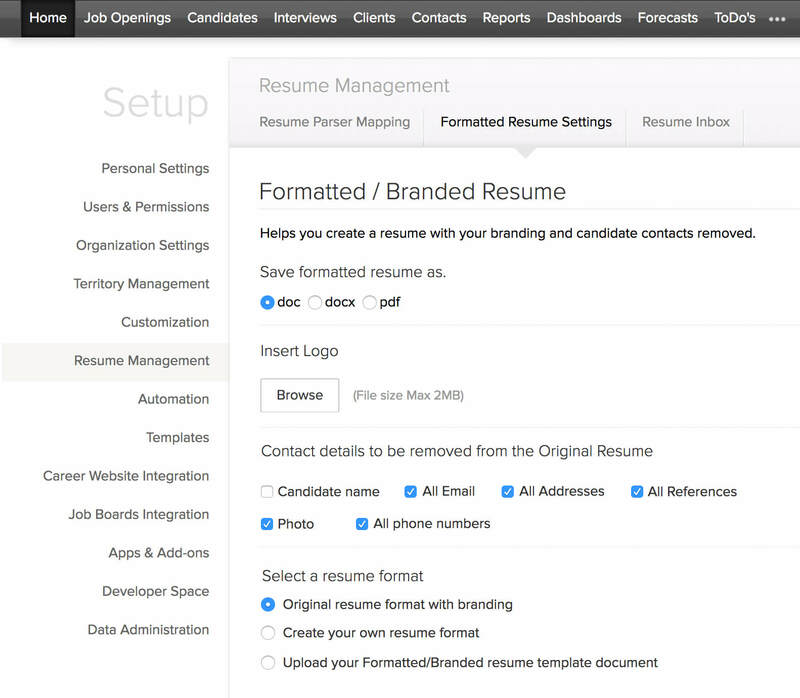 Now, bring in a sense of uniformity in the resumes you send out to your clients. Customize a template, ensure how you want your branding to be placed on it and delete candidate credentials before sending them out. Recruit already has some pre-designed themes, which you can utilise. Design your own theme and save it. As a recruiter, your inbox gets flooded with resumes on a daily basis. 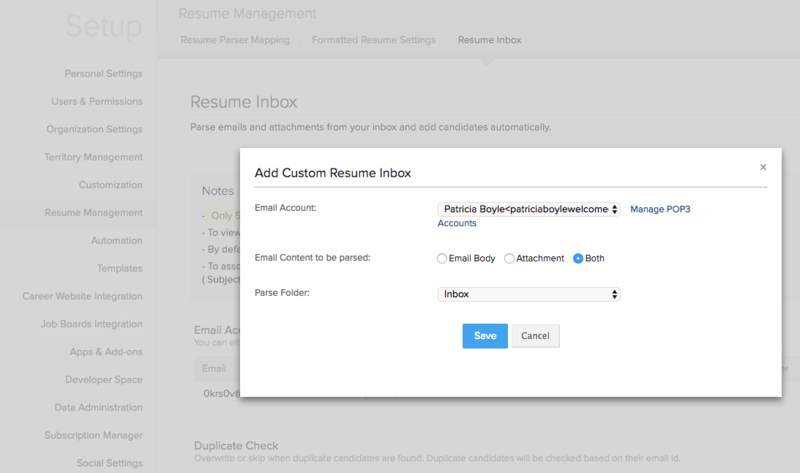 Automatically parses resumes from Zoho, Gmail, Zoho Mail and Outlook inboxes. Transfer the candidate details directly to Zoho Recruit. 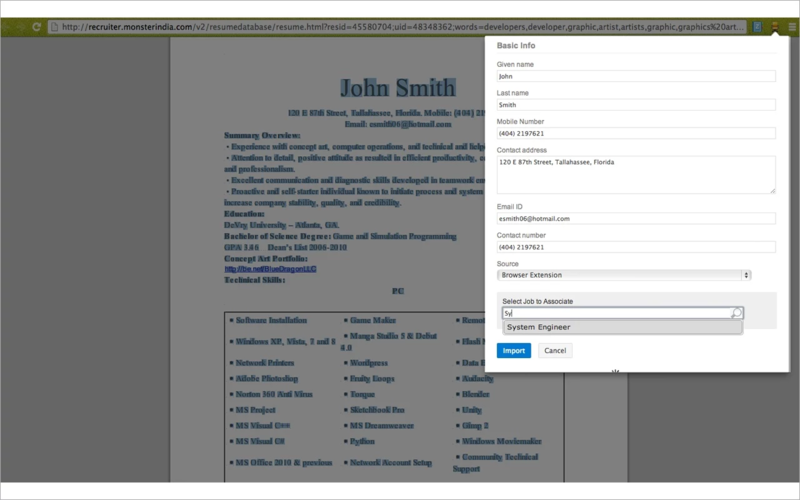 Configure this feature for any resume received from a job opening on a job board.